Hiblow air pumps are considered to be some of the best oxygen pumps available. Suitable for connection with either sewage treatment plants or fish ponds, Hiblow pumps are known for their low noise levels and low power consumption. 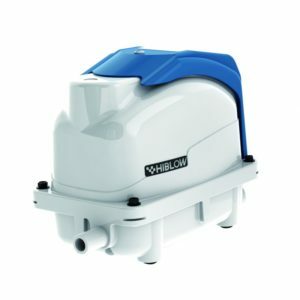 They are an excellent choice if you need to replace the air pump in your existing sewage treatment or pond installation. 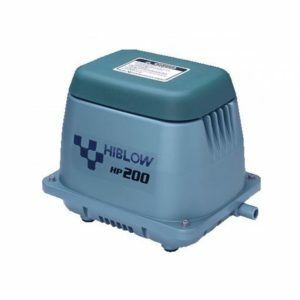 Owls Hall sells a wide range of Hiblow air pumps. The number in each product’s name indicates the amount of air that the pump produces in a minute. For example, the Hiblow HP100 produces 100 litres of oxygen per minute, while the XP80 produces 80 litres per minute. Check your installation or call for advice if you are unsure which pump you require or you’re unsure about replacing the old pump. 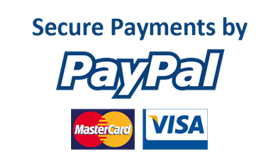 We also sell Hiblow spare parts if you need to repair your current pump. 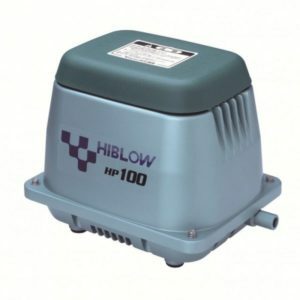 This Hiblow HP100 will deliver 100 litres per minute of air. This Hiblow HP120 will deliver 120 Litres per minute of air. This Hiblow HP150 will deliver 150 Litres per minute of air. This Hiblow HP200 will deliver 200 Litres per minute of air. 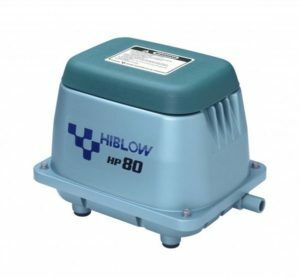 This Hiblow HP80 will deliver 80 Litres per minute of air. This Hiblow XP80 will deliver 80 Litres per minute of air.